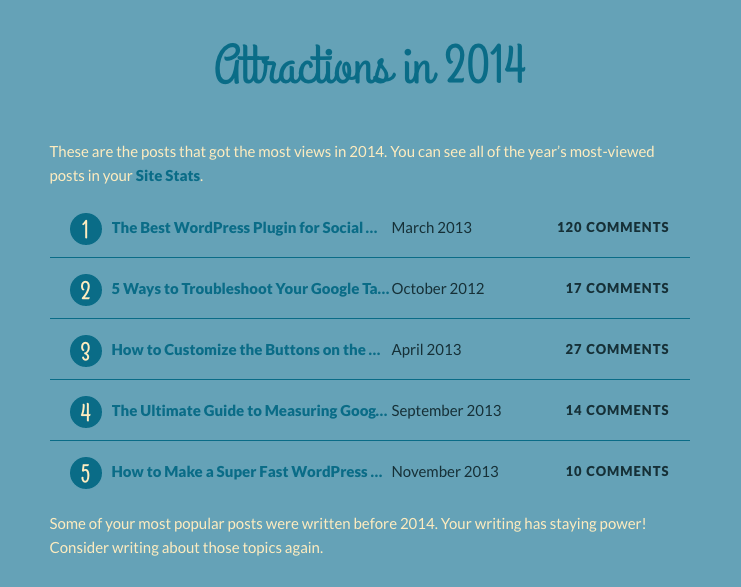 What a novel idea: taking your best posts from 2014 and sharing them on your blog. I didn’t come up with the idea, of course. But I for the past two years I have joined in the hoopla and published my stats. See 2012 and 2013. Those are stupid reasons. I committed to posting transparent goals for my website and published them for others to read. I have a responsibility to see it through. So here is the recap post, only about a month later than others. Perhaps waiting this long means this post is considered fresh? At the end of 2014, I received a really nice email from the folks at Automattic (of WordPress and Jetpack fame). They told me how I did blogging in 2014. This is purely based on traffic to the blog. Here are my most popular posts for 2014. Notice something odd here? I published every single post in 2012 or 2013. In other words, I failed 2014. SEO is still a major driver of traffic for content-heavy websites. This traffic can last for YEARS! Ok, enough beating myself up. I wrote some awesome posts, which we will get to later. I am always trying to improve the quality of my posts. This often involves having a trusted friend proof read the post before publishing. I have also started using Hemingway to highlight some of the uncool things that I put into my writing. If you don’t use the Hemingway app yet, get on it! If quality of posts has been a given on this site, quantity has been a variable beast that I have yet to tame. According to the same stats email from Automattic, I only posted 17 times in 2014. The most prominent month had 4 posts and there were two months with no posts. I have a new initiative in place for 2015 to publish an article to this blog EVERY SINGLE WEEK. And I also have a plan to hold myself accountable (in a form of public humiliation). More on this in an upcoming blog post. If you want to hold yourself accountable in the same manner, tweet me @jeffalytics and let’s discuss. Especially interested in someone who can help moderate. So what does all this have to do with traffic? Let’s address the 800 pound elephant in the room. 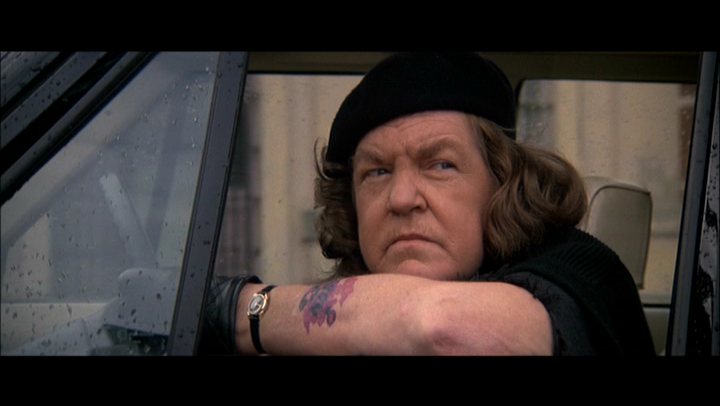 My traffic patterns look like the late Anne Ramsey from the Goonies. For a baseline, let’s start with my bragging post from March, 2014 entitled “Why I will not do SEO for you.” In that post, I highlighted my strategy for optimizing Jeffalytics and showed an awesome traffic pattern. Well, with sporadic posting I, I started to receive emails like this one from QuillEngage. 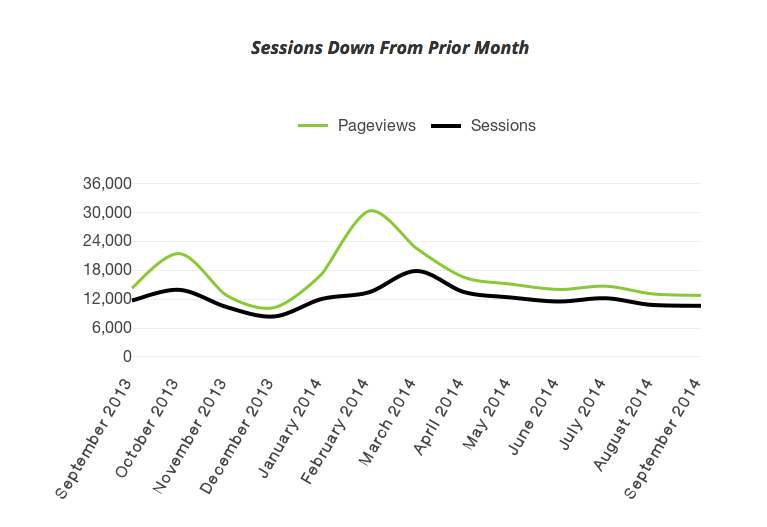 For the first time in the history of this blog, barring holidays, Jeffalytics was seeing declines in traffic. While 2% may not look bad, it was a sign of a bigger problem. The site was in a slow death roll. Yes, I was becoming the website owner who I used to make fun of. I neglected my site and thought that visitors would continue to flow. They did not. I thought my blog was doing well and in good shape, so I started doing other things. I taught in a classroom for 100+ hours in 2014. I developed a marketing certificate program at a university. I took on some great clients. I spoke at 20+ events all over the world. I moved to the west coast. All good decisions in my mind, but not good for my blog traffic. I enjoy seeing my blog traffic grow, so this is a fundamental problem. Especially when I posted my goals publicly. Fail. I did not publish any “big content” on Jeffalytics or Knowledge Land in 2014. This is something that I must improve in 2015. Big content makes everything else easier. Success. Well, this was not a success in 2014, but in January of 2015 I hit this number after adding Optin Monster to my site. I will give a .5 on this one. Success. I launched my online Google Analytics course. Sales weren’t as great as I had hoped, but I know that will pick up as I improve my launch process in 2015. Btw – the PPC Course is still accepting pre-sales for a few more days. Fail. 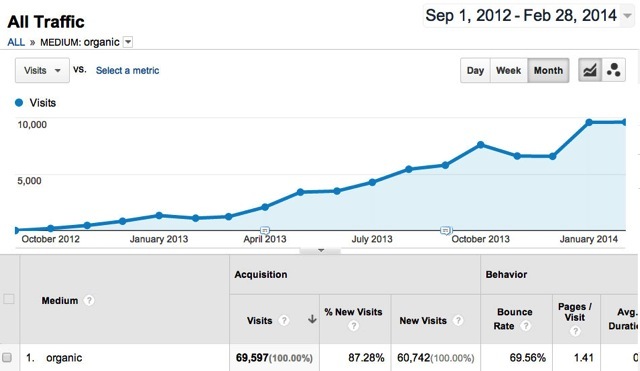 There was one single day in 2014 that reached 500+ visitors… and it was in April. My goal was to consistently hit this number, so it was a fail. Success. I learned more in 2014 than I had in any year since about 2006 when everything was still shiny and new. Everything I learned during my agency days was incremental. Improving techniques, adjusting to technology, adding to the marketplace. In 2014 I have been studying new disciplines I never anticipated. I have been studying copywriting, location independent entrepreneurship, direct response, email autoresponders, online courses, launch funnels and user analytics. It’s a completely different world than my traditional background. I am used to providing services around SEO/PPC/WordPress/Google Analytics. I have started to share what I have learned in recent Jeffalytics posts about OptimizePress. More to come. 2.5 out of 5 isn’t that bad, I guess. But I’m still a little disappointed. Publish at least one blog post per week, every week. Now that it is in writing, you can be sure that I will post something every week here. Barring death or dismemberment. Btw, I consider a week to be Sunday – Saturday. There may be some Saturday posts from a tropical island in my future. Note that I did not post the first week of the year, so this goal kicked in on January 12th. 1) I thought that I would find more time to write in 2014 once I started my own business, but the opposite happened. I found it easier to write when I was in a comfortable situation (steady employment, my own office, morning commute, etc) than when I was working from home 12 hours a day. I did not expect that. I think it must have been the time constraints put in place by a work schedule. Understand this if you think that “some day” you will have time to blog. You will never have time. 2) You never know what content is going to work the best. My number one post, by far, was something I wrote in about 2 hours one day in 2013. It wasn’t about analytics. Or SEO. Or PPC. It was about a plugin that I use for WordPress. It drew in 48,778 pageviews. People spent a combined 128 days reading that single piece of content. I made thousands in affiliate commissions from one link in that post (with disclosure of course). 3) Seeing these items, I no longer think about a blog as a short term investment. This is a long term investment and it needs fuel to grow. I was able to get over 140,000 people to visit this blog in 2014, mostly from content I wrote in 2013. If I can pick things up in 2015, I should be able to double traffic quite easily. Each year that you spend building your website has an effect on your future years. You can take a break for a year and notice little drop-off to your traffic. But if instead you keep on publishing at the same pace, you will start to see traffic reach all-time levels. Do this for several years in a row and you have formed a juggernaut. It all starts with setting a schedule and holding yourself accountable. It is time to get back to the basics. If you want to join me in committing to posting on your blog once a week, tweet, comment or fill out the form and let’s do this together.